For the novel, see The Letter of Marque. 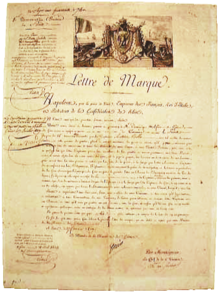 A letter of marque and reprisal (French: lettre de marque; lettre de course) was a government license in the Age of Sail that authorized a private person, known as a privateer or corsair, to attack and capture vessels of a nation at war with the issuer. Once captured, the privateer could then bring the case of that prize before their own admiralty court for condemnation and transfer of ownership to the privateer. A letter of marque and reprisal would include permission to cross an international border to effect a reprisal (take some action against an attack or injury) and was authorized by an issuing jurisdiction to conduct reprisal operations outside its borders. Popular among Europeans from the late Middle Ages up to the 19th century, cruising for enemy prizes with a letter of marque was considered an honorable calling that combined patriotism and profit. Such privateering contrasted with attacks and captures of random ships, which was unlicensed and known as piracy; piracy was almost universally reviled. In reality, the differences between privateers and pirates were often at best subtle, and at worst more a matter of interpretation. In addition to the meaning of the license itself, the terms letter of marque and privateer were sometimes used to describe the vessels used to pursue and capture prizes. In this context, a letter of marque was a lumbering, square-rigged cargo carrier that might pick up a prize if the opportunity arose in its normal course of duties. In contrast, the term privateer generally referred to a fast and weatherly fore-and-aft rigged vessel, heavily armed and heavily crewed, intended exclusively for fighting. Marque derives from the Old English mearc, which is from the Germanic *mark-, which means boundary, or boundary marker, which is derived from the Proto-Indo-European root *merǵ-, meaning boundary, or border. The French marque is from the Provençal language marca, which is from marcar, also Provençal, meaning, seize as a pledge. According to the Oxford English Dictionary, the first recorded use of "letters of marque and reprisal" was in an English statute in 1354 during the reign of Edward III. The phrase referred to "a licen[c]e granted by a sovereign to a subject, authorizing him to make reprisals on the subjects of a hostile state for injuries alleged to have been done to him by the enemy's army." During the Middle Ages, armed private vessels enjoying their sovereign's tacit consent, if not always an explicit formal commission, regularly raided shipping of other nations, as in the case of Francis Drake's attacks on Spanish shipping, of which Elizabeth I (despite protestations of innocence) took a share. Grotius's 1604 seminal work on international law, De Iure Praedae (Of The Law of Prize and Booty), was an advocate's brief defending Dutch raids on Spanish and Portuguese shipping. King Henry III of England first issued what later became known as privateering commissions in 1243. These early licences were granted to specific individuals to seize the king’s enemies at sea in return for splitting the proceeds between the privateers and The Crown. The letter of marque and reprisal first arose in 1295, 50 years after wartime privateer licenses were first issued. According to Grotius, letters of marque and reprisal were akin to a "private war", a concept alien to modern sensibilities but related to an age when the ocean was lawless and all merchant vessels sailed armed for self-defense. A reprisal involved seeking the sovereign's permission to exact private retribution against some foreign prince or subject. The earliest instance of a licensed reprisal recorded in England was in the year 1295 under the reign of Edward I. The notion of reprisal, and behind it that just war involved avenging a wrong, clung to the letter of marque until 1620 in England, in that to apply for one a shipowner had to submit to the Admiralty Court an estimate of actual losses. Although privateering commissions and letters of marque were originally distinct legal concepts, such distinctions became purely technical by the eighteenth century. The United States Constitution, for instance, states that "The Congress shall have Power To ... grant Letters of marque and reprisal ...", without separately addressing privateer commissions. During the American War of Independence, Napoleonic Wars, and the War of 1812, it was common to distinguish verbally between privateers (also known as private ships of war) on the one hand, and armed merchantmen, which were referred to as "letters of marque", on the other, though both received the same commission. The Sir John Sherbrooke (Halifax) was a privateer; the Sir John Sherbrooke (Saint John) was an armed merchantman. The East India Company arranged for letters of marque for its East Indiamen such as the Lord Nelson, not so that they could carry cannons to fend off warships, privateers, and pirates on their voyages to India and China—that they could do without permission—but so that, should they have the opportunity to take a prize, they could do so without being guilty of piracy. Similarly, the Earl of Mornington, an East India Company packet ship of only six guns, too carried a letter of marque. In July 1793, the East Indiamen Royal Charlotte, Triton, and Warley participated in the capture of Pondichéry by maintaining a blockade of the port. Afterwards, as they were on their way to China, the same three East Indiamen participated in an action in the Straits of Malacca. They came upon a French frigate, with some six or seven British[clarification needed] prizes, replenishing her water casks ashore. The three British vessels immediately gave chase. The frigate fled towards the Sunda Strait. The Indiamen were able to catch up with a number of the prizes, and, after a few cannon shots, were able to retake them. Had they not carried letters of marque, such behaviour might well have qualified as piracy. Similarly, on 10 November 1800 the East Indiaman Phoenix captured the French privateer General Malartic, under Jean-Marie Dutertre, an action made legal by a letter of marque. Additionally, vessels with a letter of marque were exempt from having to sail in convoy, and nominally their crew members were exempt, during a voyage, from impressment. During the Napoleonic Wars there were also two cases (Dart and Kitty), where British privateers spent some months off the coast of Sierra Leone hunting slave-trading vessels. A letter of marque and reprisal in effect converted a private merchant vessel into a naval auxiliary. A commissioned privateer enjoyed the protection and was subject to the obligations of the laws of war. 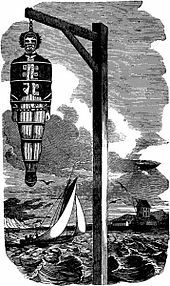 If captured, the crew was entitled to honorable treatment as prisoners of war, while without the licence they were deemed mere pirates "at war with all the world," criminals who were properly hanged. For this reason, enterprising maritime raiders commonly took advantage of "flag of convenience" letters of marque, shopping for cooperative governments to license and legitimize their depredations. French/Irishman Captain Luke Ryan and his lieutenants in just over two years commanded six vessels under the flags of three different nations and on opposite sides in the same war. Likewise the notorious Lafitte brothers in New Orleans cruised under letters of marque secured by bribery from corrupt officials of tenuous Central American governments, to cloak plunder with a thin veil of legality. The letter of marque by its terms required privateers to bring captured vessels and their cargoes before admiralty courts of their own or allied countries for condemnation. Applying the rules and customs of prize law, the courts decided whether the letter of marque was valid and current, and whether the captured vessel or its cargo in fact belonged to the enemy (not always easy, when flying false flags was common practice), and if so the prize and its cargo were "condemned", to be sold at auction with the proceeds divided among the privateer's owner and crew. A prize court's formal condemnation was required to transfer title; otherwise the vessel's previous owners might well reclaim her on her next voyage, and seek damages for the confiscated cargo. Often questions arose as to the legitimacy of the letter of marque in the case of divided sovereignty during civil wars. An English court, for instance, refused to recognize the letters of marque issued by rebellious Ireland under James II, and hanged eight privateer captains as pirates. Seventy-nine years later during the American Civil War, the Union charged officers and crew of the Confederate privateer Savannah with piracy, calling their letter of marque invalid since the Union refused to acknowledge the breakaway Confederacy as a sovereign nation. The case resulted in a hung jury, and after Confederate President Jefferson Davis threatened to retaliate by hanging one Union officer for each executed Confederate privateer, the Union relented and thereafter treated Confederate privateersmen honorably as prisoners of war. Privateers were also required by the terms of their letters of marque to obey the laws of war, honour treaty obligations (avoid attacking neutrals), and in particular to treat captives as courteously and kindly as they safely could. If they failed to live up to their obligations, the Admiralty courts could — and did — revoke the letter of marque, refuse to award prize money, forfeit bonds, or even award tort (personal injury) damages against the privateer's officers and crew. Nations often agreed by treaty to forgo privateering, as England and France repeatedly did starting with the diplomatic overtures of Edward III in 1324; privateering nonetheless recurred in every war between them for the next 500 years. Benjamin Franklin had attempted to persuade the French to lead by example and stop issuing letters of marque to their corsairs, but the effort foundered when war loomed with Britain once again. The French Convention did forbid the practice, but it was reinstated after the Thermidorian Reaction, in August 1795; on 26 September 1797, the Ministry of the Navy was authorized to sell small ships to private parties for this purpose. Finally, after the Congress of Paris at the end of the Crimean War, seven European nations signed the Paris Declaration of 1856 renouncing privateering, and forty-five more eventually joined them, which in effect abolished privateering worldwide. The United States was not a signatory to that declaration. Despite the attempt to end privateering around the world, nations continued issuing letters of marque. In 1879 at the beginning of the War of the Pacific, Bolivia issued letters of marque to any vessels willing to fight for them. At the time Bolivia was under threat from Chile's fleet but had no navy. In December 1941 and the first months of 1942, Goodyear commercial L class blimp Resolute operating out of Moffett Field in Sunnyvale, California, flew anti-submarine patrols. As the civilian crew was armed with a rifle, many[who?] thought this made the ship a privateer, and that she and sister commercial blimps were operated under letter of marque until the Navy took over operation. Without congressional authorization, the Navy would not have been able to legally issue any letters of marque. Article 1 of the United States Constitution lists issuing letters of marque and reprisal in Section 8 as one of the enumerated powers of Congress, alongside the power to tax and to declare War. However, since the American Civil War, the United States as a matter of policy has consistently followed the terms of the 1856 Paris Declaration forbidding the practice. The United States has not legally commissioned any privateers since 1815, although the status of submarine-hunting Goodyear airships in the early days of World War II created significant confusion. Various accounts refer to airships Resolute and Volunteer as operating under a "privateer status", but Congress never authorized a commission, nor did the President sign one. The issue of marque and reprisal was raised before Congress after the September 11 attacks and again on July 21, 2007, by Congressman Ron Paul. The attacks were defined as acts of "air piracy" and the Marque and Reprisal Act of 2001 was introduced, which would have granted the president the authority to use letters of marque and reprisal against the specific terrorists, instead of warring against a foreign state. The terrorists were compared to pirates in that they are difficult to fight by traditional military means. On April 15, 2009, Paul also advocated the use of letters of marque to address the issue of Somali pirates operating in the Gulf of Aden. However, the bills Paul introduced were not enacted into law. ^ Hewitson, Skull and Satire, p. 19–20. ^ Konstam, Pirates: Predators of the Seas, p. 10. ^ Donald Petrie, The Prize Game p. 4: Noting cumberous square-rigged cargo carriers that often secured letters of marque "just in case", "[c]onfusingly, such vessels were themselves called 'letters of marque'." Geoffrey Footner, Tidewater Triumph, pp ? : Discusses the difference between letter of marque vessels and privateers. ^ 2nd ed. (Clarendon Press, 1989) ( def. 1 of "marque" & def. 2a of "marque" defining "letter of marque"). ^ Lord Russell, The French Corsairs p. 10 (discussing history of private plundering ventures). ^ Grotius, De Iure Praedae Commentarius (Commentary on the Law of Prize and Booty)pp 216-182 (Carnegie endowment translation of Grotius's Commentaries; the 12th Chapter later became the basis of the noted Mare Liberum (Freedom of the Seas) principle). ^ Francis R. Stark, "The Abolition of Privateering and the Declaration of Paris," in Studies in History, Economics and Public Law 221, 270–71 (Faculty of Political Sci. of Columbia Univ. eds., Columbia University, 1897). ^ Grotius, De Iure Praedae Commentarius (Commentary on the Law of Prize and Booty), pp. 62 (stating "the power to wage war privately resides in the individual, and the power to wage war publicly resides in the state"). ^ Eastman, Famous Privateers of New England p. 1 (citing Edward I 1295 reprisal commission). ^ Lord Russell, The French Corsairs p. 12(discussing early practice in England). ^ Eastman, Famous Privateers of New England p. 1 (recounting early letters of marque issued in contest between Spain and her revolted Low Countries in 1569). ^ Lord Russell, The French Corsairs p. 11(discussing history of letters of marque: in France the first recorded use of letters of marque and reprisal was 1681). ^ Upton's Maritime Warfare and Prize p. 176 (discussing the history of letters of marque and reprisal). ^ Henry, R.A. The Reclamation of the Braye du Valle 1806-2006. ^ David J. Starkey, British Privateering Enterprise in the Eighteenth Century 20, 81 (1990). ^ "The Constitution of the United States", Article 1, Section 8, Clause 11. ^ "No. 15397". The London Gazette. 15 August 1801. p. 1006. ^ "Answers" (1911) Mariner's Mirror, Vol. 1, №9 (September), pp.255-6. ^ Eastman, Some Famous Privateers p. 45 (reproducing a letter of marque granted in 1815 to the Grand Turk). ^ Girard, Peter (1990). More of Peter Girard's Guernsey: A Second Miscellany of Guernsey's History and Its People. Guernsey Press. ISBN 978-0902550421. ^ Donald Petrie, The Prize Game pp. 3-6, 68, 145 (noting difference between privateering and piracy; some, like Captain William Kidd, crossed back and forth over the line). ^ Petrie, The Prize Game p. 68 (discussing Luke Ryan--in these two years they took 140 recorded prizes). ^ William Davis, The Pirates Laffite p. ?. ^ Upton, Maritime Warfare and Prize p. 188 (saying prize court condemnation essential to convey clear title). ^ Petrie, The Prize Game p. 81 (discussing English hangings after rejecting as illegitimate letters of marque issued by Irish under James II, and the Confederate case of the Savannah). ^ "An Introduction to Privateering History | Shady Isle Pirate Society". bbprivateer.ca. Retrieved 2018-08-09. ^ Robinson, The Confederate Privateers pp 133-151(chapter recounting trial of crew of Savannah and Davis's response; noting the Earl of Derby in the House of Lords protested the Union's treating privateers as pirates). ^ Eastman, Famous Privateers of New England p. 44-45 (recounting a custom of the War of 1812, that British captives would insert in New England newspapers "a card of thanks expressing their appreciation for kind treatment accorded them as prisoners." ^ Petrie, The Prize Game p. 158 (noting that in 1803 Lord Stowall fined the British captors of two vessels for keeping the captive Spanish crews in irons). ^ Lord Russell, French Corsairs at 13-33 (discussing repeated diplomatic efforts to ban privateering between France and England). ^ Lord Russell, French Privateering p. 34-35(discussing Franklin's efforts to persuade the French Legislative Assembly to ban privateering). ^ Granier, Hubert (1998). Histoire des Marins français 1789-1815. illustrations by Alain Coz. Marines éditions. p. 341. ISBN 2-909675-41-6. William C. Davis, The Pirates Laffite: the Treacherous World of the Corsairs of the Gulf (Orlando, Fla.: Harcourt, 2005). Ralph M. Eastman, Some Famous Privateers of New England, (Boston: Privately printed by State Street Trust Company, 1927). Geoffrey Footner, Tidewater Triumph: The Development and Worldwide Success of the Chesapeake Bay Pilot Schooner (Mystic, Conn: Mystic Seaport Museum, 1998). Grotius, De Iure Praedae Commentarius (Commentary on the Law of Prize and Booty) (Oxford: Clarendon Press, 1950). Angus Komstan, Roger Michael Kean, Pirates: Predators of the Seas (Skyhorse Publishing, 2007). Donald Petrie, The Prize Game: Lawful Looting on the High Seas in the Days of Fighting Sail (Annapolis, Md. : Naval Institute Press, 1999). William Morrison Robinson, Jr., The Confederate Privateers (Columbia, S.C.: University of South Carolina Press, 1928). Lord Russell of Liverpool, The French Corsairs (London: Robert Hale, 2001). ISBN 0-7091-1693-4. Carl E. Swanson, Predators and Prizes: American Privateering and Imperial Warfare, 1739-1748 (Columbia, SC: U. South Carolina Press, 1991). Francis Upton, Upton's Maritime Warfare and Prize (New York: John Voorhies Law Bookseller and Publisher, 1863). This page was last edited on 17 April 2019, at 14:00 (UTC).